Two years ago, Isaac Franco was in the stands of the sold-out L.A. Memorial Coliseum watching USC face Texas. “Who knows, next year you could be cheering for me out there,” he said at one point during the game. For someone who has never met Franco, this comment may sound smug. But those around him knew that he was on a meaningful journey. He would never say that out of arrogance, but simply out of confidence, with a sense of believing in himself and his capabilities. Regardless, he was right. The next time USC played Texas in 2018, Franco was no longer in the stands — he was on the field as a walk-on player. But his journey there wasn’t so simple. Franco started his college career playing lacrosse at Adams State University in Colorado. When he got there, he received a major wake-up call. Skill meant very little at the college level, and just being good at lacrosse wasn’t enough; he needed to be a well-rounded athlete. Two years into his career at Adams State, the Franco family fell on hard times and Isaac had to come home to Los Angeles and work to support his family. As broken as he was to be leaving college, Franco took initiative and was hired at LA Fitness. After just one year, he became the club manager, and his franchise rose to No. 1 in sales nationwide. When Franco was able to return to school, he had to be dragged away. He was making serious money at LA Fitness, and it was mentally difficult for him to transition back to school. But it was important to his mom that he finish his degree because she hadn’t been able to finish hers. So he applied to USC as a human biology major with an emphasis on human performance. 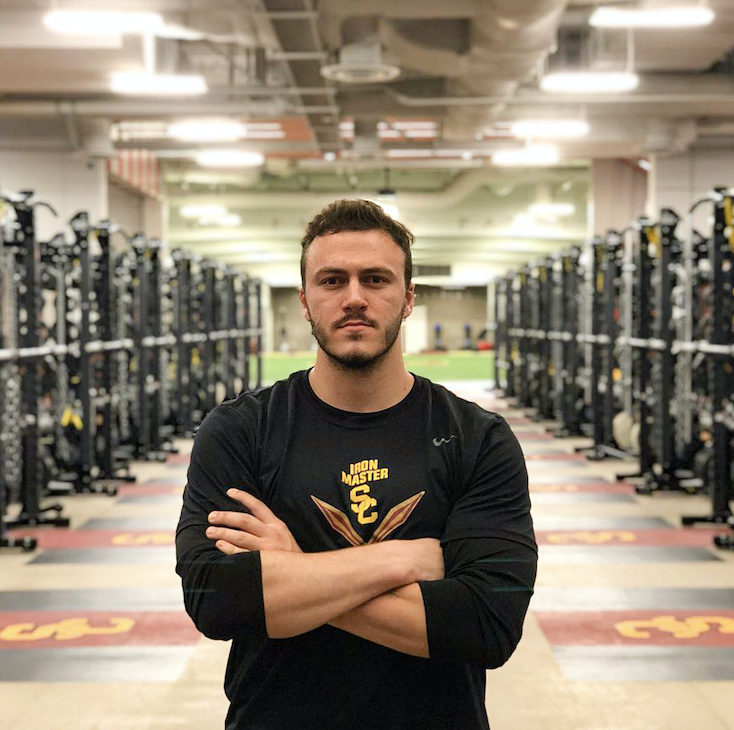 When he matriculated at USC and reconnected with high school friends Kellen Ware and David Benavides, the trio started working out together regularly. (Ware graduated from USC last fall and Benavides is a senior majoring in real estate development). This is when Franco’s story really begins. Ware and Benavides joked that they should try to walk on to the football team, but the minute they said it aloud, it was no longer a joke in Franco’s mind. Ware, who is also Franco’s “big” in their fraternity, Pi Kappa Alpha, said he never saw Franco as a football player, but rather purely as a lacrosse guy. In high school, Franco was the punter and in one game even had negative punting yards, Ware said, laughing. Noone on their high school team would have thought that Franco would be a lineman at USC. But once Ware saw Franco was so dedicated to their dream, he and Benavides really started to buy in: Franco made them believe in themselves. Ware said the best part of his day was those three hours in the gym with Franco and Benavides. It was hard work, but the three shared a competitive spirit and were motivated by their friendship. For the next six months, Franco spent three hours a day in the weight room. He put on 35 pounds. He had played football in high school, but lacrosse had always been his focus, so he used his savings to hire a coach to help him with fieldwork. He would sneak into the McKay Center and find ways to “coincidentally” run into then-head strength and conditioning coach Ivan Lewis. Franco did all this while commuting to campus from home every day. After his time away from school, he needed something to keep him mentally grounded at USC, and this was it. But then, he was cut in the final round of tryouts his junior year. However, Franco left thinking not about what he did wrong, but what he could do better next time. He told himself that if he tried one more time, he would make it. His lofty aspirations were no secret, either. He told people about it on purpose because he wanted them to hold him accountable. The fact that everyone who knew him also knew about this goal provided extra pressure that he thrived under. But at the end of the day, Franco wasn’t pursuing football for anyone but himself. He told himself he was going to do it, so he had to go through with it. He had to be relentless, put in the hours and make the sacrifices. Franco said that a true athlete has to be built a certain way, that they have a quality of always giving their all and an inherent drive to be at the top. When another year of training came, Franco came down with bronchitis the day before tryouts. But true to form, he didn’t dwell on that. In fact, he was happy he had bronchitis. His journey to get this far had been so hard, the final test should be difficult, too. When he made the team, that was only the beginning for Franco. That was when the real work started. 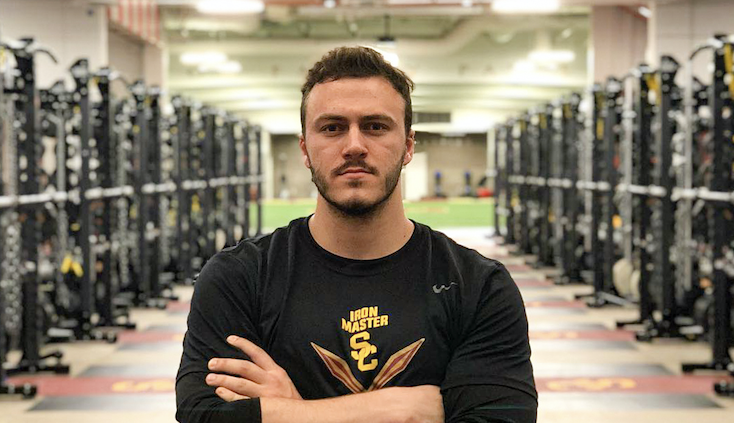 He gave it his best every day, even approaching senior linebacker Porter Gustin and asking if he could join in on his famous midnight workouts with other starters. He learned as much as he could and tried to be a good teammate, making the people around him better. It was the greatest year of his life, Franco said, even though playing for USC last season was difficult for him. He suffered a torn labrum and a broken toe, which hampered his ability to compete. In the end, he didn’t get the playing time he had wanted, which he says wasn’t unfair at all, that sometimes your best just isn’t good enough. On Senior Night at the L.A. Memorial Coliseum, Franco chose his parents, Ware and Benavides to appear on the field with him for the pre-game ceremony. He said he is forever indebted to his two friends because without their support, he never could have achieved his dream. Sometimes they didn’t want to work out and stick to the plan as much as Franco did, but they still showed up to the gym every day for their friend because they knew it was important to him. When the 2018 season ended that night with a loss to Notre Dame, Franco approached head coach Clay Helton to shake his hand and thank him for the opportunity to play in Cardinal and Gold. He also apologized for not being able to contribute more and help on the field because he felt he had let himself and his teammates down. But Helton’s response epitomizes the value of the journey for Franco. Franco said Helton probably doesn’t even remember the conversation, but that his words meant a lot. Overall, Franco said all his sacrifices were worth it. He didn’t get too caught up in the pageantry of the sport — he just cared about football, but he cannot explain the feeling of running out the tunnel onto the Coliseum field. From dropping out of college to being cut from the team the first time he tried out, Franco’s journey to living out his dream was long and hard but he gave his all every single day.